Instagram is a cool way to stay in touch with your friends. But just as it is with all other social media apps, it is prone to problems. Because of its wide reach, it is easy to connect with the wrong people on Instagram. Instances of stalking or someone sending you untoward messages and images on the app are all too common. The good news is, if you find yourself in a situation you don’t like, someone sending you messages that you find insulting or stalking, Instagram gives you a way to block the person from accessing your account. If you would like to keep someone from messing up your Instagram experience, the following article will help you block the person. For added measure, we’ll also show you how you can unblock a person, just in case you need to. If you want to stop someone from sending you messages or even just interacting with you in any way on Instagram, follow these simple instructions to block that particular individual. Step 1: Launch the Instagram app on your iPhone and log in, if you aren’t already logged in. Step 2: Tap on “Account Settings” located at the lower right to open up your personal profile. Step 3: Tap on “Followers” or “Following” and go through the list of people following you or people you follow to find the person you want to block. Step 4: Tap on their profile and the select the “More” button (usually looks like three dots) and then select “Block” from the options presented. Step 5: Tap “Block” again to confirm the action and you’re done. The person will be unable to contact you or view your activity. It is very likely that you can block someone accidentally or you can block a friend you haven’t been getting along with and then makeup. In this instance, it helps that Instagram also comes with an unblock option. Here’s how to use it. Step 1: Launch the Instagram app on your device and then select “Settings” on the upper right. Step 2: Scroll down to fond “Blocked Users” and tap on the person you wish to unblock. Step 3: From here you can either tap “Follow” to follow and consequently unblock that person or you can choose the “More” options button (three dots) and choose “Unblock” from the options presented. Confirm by tapping “Unblock” again and you’re friends again. 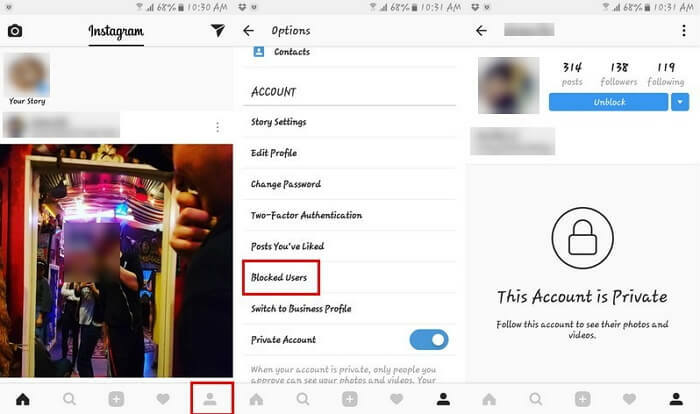 You may have a couple questions about blocking or unblocking people on Instagram. The following are just some of the most common ones and their corresponding answers. 1. What Happens when you Block someone? 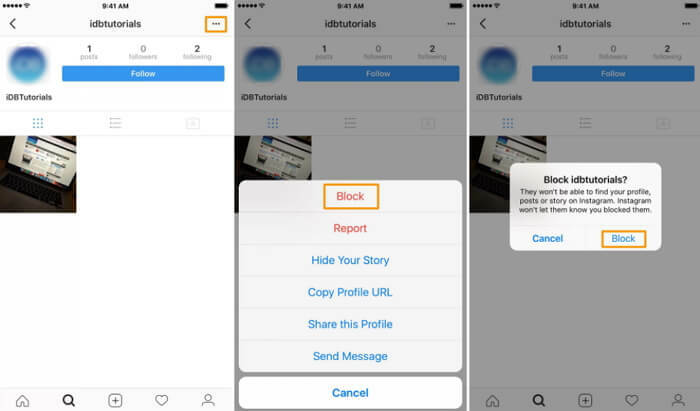 The person you block will not be able to find your profile, posts or story on Instagram. They are not notified that you’ve blocked them. 2. Can Someone I Block Mention me? The person you’ve blocked can still mention your username but the mention will not appear in your activity. To prevent them from mentioning your username, you can block the person and then change your username. 3. Will their Likes and Comments Disappear? Their likes and comments will not be removed from your videos and photos. To do this, you have to delete their comments from your posts. 4. Will they Still see my Likes on Comments? People you block will still be able to see your likes and comments on posts that were shared publicly or by accounts that they follow. So, if you have mutual friends, they will still see your likes and comments.